Yeah. I know. Date and Nut Truffles isn’t a headline that grabs me either, but I’m trying really hard to be a little healthier so this is what we have to work with. Attempting to be healthier means I’m not baking bread as much. I’ve started saving great cookie, cake and brownie recipes to experiment with only on special occasions. At the same time I’ve readjusted my definition of a special occasion from being whenever I’m bored to those times there is actually something to celebrate (and making sure that more people than just Regan and I are around to take part in the food and festivities). We’re upping the vegetable and nut intake a bit and taking a break from my unshakable dependence on grains (delicious, delicious grains). This altered way of eating leaves me with a feeling that I’m never satiated, along with a wicked sweet tooth. I’ve taken a grain hiatus before and I know this seeming inability to be satiated doesn’t last long, but in the meantime I’m relying on some dates, nuts and cocoa powder to get me through. I’m pretty good at fooling my belly into believing something is just what I was in the mood for if it looks the part, even if it’s not spot on in the taste department. These little truffles are simple to make and pack a really sweet punch. While cocoa powder is a big ingredient, the Medjool dates are the overriding taste. But even though they aren’t perfect substitutes for cream and chocolate truffles, just one or two of these guys allows me calm my sweet tooth and take a break from wishing I had more friends so there would be more birthdays to celebrate and, therefore, more special treats to make and enjoy. In a food processor, grind the walnut until fine. Add pitted dates and 2 tablespoons cocoa powder to the walnuts and blend until well-mixed. Mixture should form balls easily. 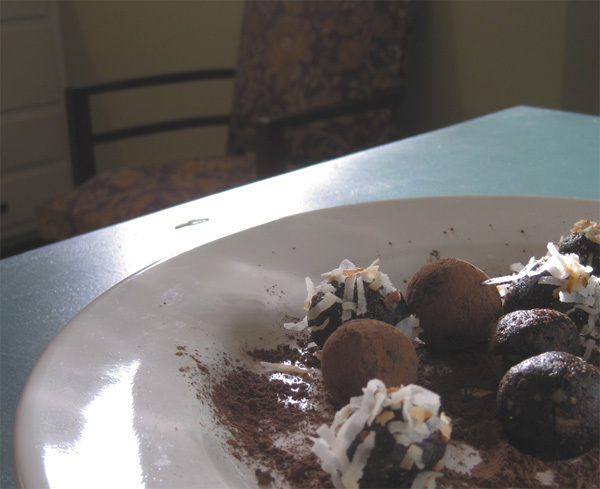 Break off pieces of mixture and form truffles, dusting them first lightly with cocoa powder then roll in toasted coconut. ETA: So, after some experimenting, I’ve come up with a less date-tasting, more chocolate-tasting truffle. Here’s the recipe I’ve come to really like. In a food processor mix all ingredients until well incorporated and the mixture has a sticky consistency that rolls into balls easily. One at a time, roll mixture into bit-sized truffles and place on small platter. Refrigerate until solid. Enjoy.